Annica Nsiah-Apau, wife and manager of Ghanaian rapper Okyeame Kwame says she feels honored that her husband was adjudged the Male Fashion Celebrity Icon of the Year at the just ended e.TV Ghana Fashion Awards 2016 because he really works hard to look good. Okyeame Kwame beat former Black Stars captain, Stephen Appiah and Kofi Okyere Darko (KOD) to emerge winner of the Male Fashion Celebrity Icon category. According to his wife, though everyone in that category deserved to win, it meant that the organizers and judges of the event appreciated Okyeame Kwame’s unique style of dressing. 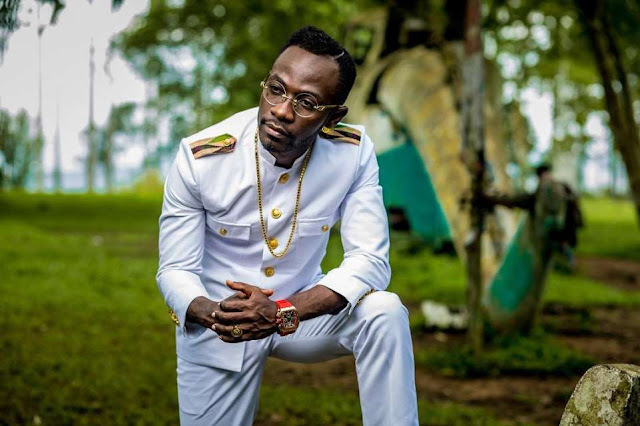 “Most of all he is a gentleman who also stands for positivity and so he also dresses according to that,” Okyeame Kwame’s wife stated. Annica said Okyeame Kwame, who is known in real life as Kwame Nsiah-Apau, could not pick up the award himself as he was away in the US on business where he was honoured by the Mayor of Cincinnati. The award entailed the key to the City of Cincinnati and an Okyeame Kwame Day celebrated in Cincinnati every year. This year’s Ghana Fashion Awards which was organized by e.TV Ghana –a subsidiary of Global Media Alliance Broadcast Company - saw a display of fashion prowess by both fashion designers, models and patrons of the event. The show, hosted by e. TV Ghana’s Fati Shaibu Ali and Happy FM’s DJ Advicer, had amazing performances from fast rising songstress eShun. Other high profile personalities like Sandra Ankobiah picked up awards at the event. The winners for this year’s Ghana Fashion Awards are: Emerging Designer – Ato Tetteh, Designer of the Year – Sima Brew, Accessory Designer of the Year (Jewelry) – Joyce Owusu (Purple Trendz), Accessory Designer of the Year (Bags, Sandals) – Mpaboa. The rest are Female Fashion Celebrity Icon of the Year – Sandra Ankobiah, Fashion Photographer of the Year – Duke Tetteh Quarshie, Male Model of the Year – Meek Ghartey, Female Model of the Year – Leana Efia Apenteng.